Bodegas Faustino, located in Oyón, Rioja Alavesa, enjoys international renown earned over more than 150 years of experience in the production and ageing of premium wines. Crossing the doors of Bodegas Faustino is like stepping right into the history of wine. It is an unforgettable experience in a winery with the most extensive worldwide recognition. It is losing oneself in an immense barrel hall or in the spectacular bottle ageing cellars. It is discovering a great winery where more than nine million bottles are resting. It is sharing the passion of a family for the land and a respect for a centuries-old tradition in creating wines. Bodegas Faustino owns about 650 hectares of vineyards in the best areas of the DOCa Rioja, in the municipalities of Laguardia and Oyon, and is one of the largest owners of vineyards in Rioja. The land of Rioja Alavesa offers exceptional qualities; a chalky-clay soil and an optimum microclimate to cultivate unbeatable quality grape varieties. These wines are exceptional quality and outstanding value, epitomising the features of great Spanish wines that are driving the phenomenal growth in consumption in Australia. The reputation of Bodegas Faustino centers on the quality and complexity in the wines they develop, adhering to a stringent process using a combination of ageing in oak barrels and bottle prior to launch. Their wines are classified based on this ageing process, delivering wines of great depth and balance. Faustino V Reserva is a red wine from the La Rioja region of Spain. La Rioja is one of the most iconic areas for wine production in the world, known for its exceptional soils and climates. Presented in the iconic frosted bottle, Faustino V Reserva is made from 92% Tempranillo and 7% Mazuelo and aged for 18 months in American Oak Barrels. Rioja Reserva designation is granted to wines that have been aged for at least three years, at least one of which was in oak barrels. Appearance: Clean, bright, medium-long depth robe, cherry red developing to maroon. Aroma: Strong on the nose, complex, well integrated aroma, sweet notes due to the barrel ageing, such as cedar, cinnamon, clove and ripe fruit hints on the background. Palate: Pleasant in the beginning, elegant structure, perfect acidity and balanced as a whole. Medium-long finish, with sweet touch due to the barrel. Thanks to the careful selection of grapes and winemaking methods that combine tradition and innovation, Faustino I Gran Reserva is a beautiful demonstration of how wonderful a Rioja can be. Presented in the iconic frosted bottle, this wine is made from Tempranillo, Graciano and Mazuelo. Rioja Gran Reserva designation is granted to wines that have been aged for at least two years in oak barrels and 3 years in a bottle. Appearance: Medium depth ruby colour developing to maroon. Aroma: Complex and elegant aroma, wide ripe fruit hints, spicy notes, slight blond tobacco and cedar hints. Palate: Elegant on the palate, good balance between acidity and tannins with a silky finish. Faustino VII is an entry level Rioja carefully crafted using only Tempranillo grapes. Despite its status as a vin joven (young wine) it is made with great care and benefits from aging in both the barrel and bottle. 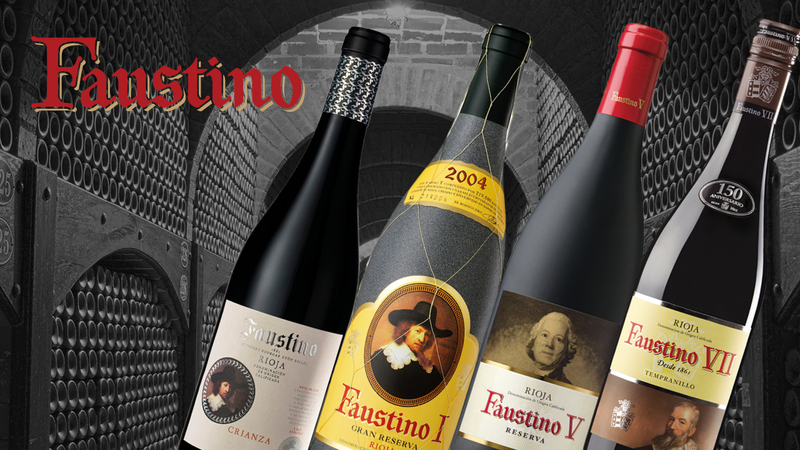 Made from 100% Tempranillo grapes the Faustino VII is aged for 6 months in American oak barrels. Appearance: Clean, bright, medium depth robe, picota cherry red developing to maroon. Aroma: Good strength. Pleasant with red fruits hints, slightly ripened, sweet touch due to its barrel ageing. Palate: Fresh and elegant, fine tanin, pleasant withslightly ripened fruit hints. Medium length.